There has been a large increase in the amount of people who are either wanting signatures or people that are uncertain how to post pictures, avatars and signatures. 1. How do I post up pictures? Or the old more simplified uploader. And bobs you uncle the image will work. Please however be aware of those using a 56k modem and please resize your pictures before posting them up. A good size per picture is about 600x (Whatever your computer works it out to be as). You can always Pm a member for a larger sized pic. 2. How do I post up an avatar? I will start with the avatar. Posting an avatar up is very much the same as posting up an image but it is very important that your avatar be the correct size. The maximum size for an avatar on this forum is 65x (Whatever your computer works it out to be as). Any bigger than that and your avatar will not usually show. Which should be a normal Http: address without IMG in brackets etc around it. 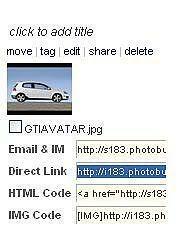 The little image on top should change to your chosen avatar image as soon as you have pasted the link. 3. How do I post up a signature? And then insert it here under the Forum Profile Information section of your profile. As you can see the Signature and avatar are present. 4. Who can I ask to create a signature for myself? 5. What should I email you? Sounds like a silly question but I thought I would include it. The first thing is a few pictures of your car/s. Prefferably your favourite ones and if possible please send them without resizing them. Its easier to work with an image that has a higher resolution. I don t think the forum allows advertising (Steve what are the rules on this?) but obviously I dont see why you cant have your companies name in your signature with your logo or number. Please remember though that this is a public forum and your information in your signature is viewable by anyone with internet access. 1. Black your number plates out when you post images up. This is the easiest way for a thief to track you down. 2. Try not to take pictures of your vehicles in your driveway while facing your house. This is simply saying, here is my house number, and car. Please steal me. I think that is about everything to do with posting images and signatures. If I have missed anything or anyone has any questions feel free to ask me or Steve or TC. No PAS. No ESP. No DSC. No TCS. No ABS. Just my right foot between me and oblivion. Oh - And a seatbelt.